Submucosal tunneling endoscopic resection (STER) and endoscopic submucosal excavation (ESE) were recently introduced to cure submucosal tumors (SMTs) originating from the muscularis propria (MP) layer. This study aimed to compare clinical performance and safety of STER and ESE in treating esophageal SMTs originating from the MP layer. 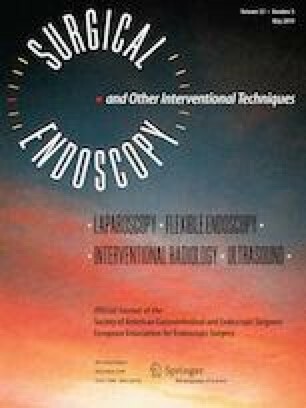 From January 2011 to December 2017, retrospective data collection and follow-up were applied for all STER or ESE cases with esophageal SMTs originating from the MP layer in our endoscopy center, including clinical characteristics, procedure success, efficacy, and adverse events. Subgroup analysis was further done based on tumor size and origin. 90 STER and 77 ESE were enrolled in this study. There were no significant difference for patient characteristics, procedure performance, and complications for ESE and STER intervention (P > 0.05). STER was faster than ESE (3.90 mm2/min vs 2.82 mm2/min, P < 0.05). For large tumors (≥ 20 mm), both techniques had the similar performance (P > 0.05), while STER led to the shorter hospitalization (4.0d vs 7.0d, P < 0.05) and lower postoperative complication (16.3% vs 45.5%, P < 0.05). For small tumors (< 20 mm), STER achieved faster operation (STER vs ESE, 2.57 mm2/min vs 1.83 mm2/min, P < 0.05). Regardless of tumor origin, there were no significant difference for both techniques, but STER resulted in short hospitalization for SMTs from the deep MP layer (STER vs ESE, 5.0d vs 7.0d, P < 0.05). During the follow-up, 2 residual and 4 recurrence occurred in the STER group, as well as 1 residual and 2 recurrence in the ESE group. Both STER and ESE were effective for treating esophageal SMTs originating from the MP layer. STER might be better due to its faster operation, less complications, and shorter hospitalization. Yingtong Chen and Min Wang contributed equally to this article. This study was funded by Jiangsu Province “333” project (BRA2015463); The Priority Academic Program Development of Jiangsu Higher Education Institutions (JX10231802); Jiangsu Province Key technology research Program (BE2016738); The Key Medical Program of Jiangsu Province (ZDXKA2016005); and National Natural Science Foundation of China (81700577). Drs. Yingtong Chen, Min Wang, Lili Zhao, He Chen, Li Liu, Xiang Wang, and Zhining Fan have no conflicts of interest or financial ties to disclose.